The North Central Chapter of the American Institute of Floral Designers scored a triple play at the Indiana Flower and Patio Show which showcased over 40 landscaped gardens, drew 300 exhibitors and hosted 100,000 visitors. The chapter did 17 stage presentations, offered 17 hands-on workshops and sold fresh cut flowers. Proceeds from the sales benefited the chapter’s scholarship and education funds. Carolyn Kurek, AIFD, handing out flowers at the stage presentations. Co-Chairs Carolyn Kurek, AIFD, and Debi Dawson, AIFD, coordinated participation in the show. Carolyn Minutillo, AIFD, orchestrated stage presentations on trends in bridal bouquets and Renee Blitek, AIFD, offered her design expertise in DIY hands-on bridal workshops. 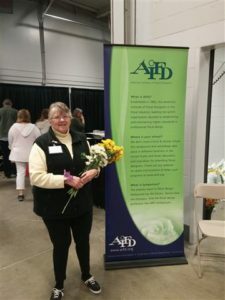 Debi Dawson, AIFD, took the stage and demonstrated her knowledge of hand-tied and vase arrangements and then followed up with hands-on workshops where those attending learned to make a vase arrangement and stake it home. Bob Friese, AIFD, wowed the attendees with his designing for Garden Club competitions. Assisted by James Lutke, he hosted hands-on workshops constructing his signature “Birds” from moss and branches. Pete Samek, AIFD, amazed the audience with his stage presentations featuring incredible armature designs. He then offered a hands-on workshop where the consumers created their own armature design. Pat Scace, AIFD, brought all her green plant wisdom and shared with the audience on caring for green and blooming plants in the home and offered hands-on workshops with a retro touch – terrariums. Frank Feysa, AIFD, giving his talk on orchid care. 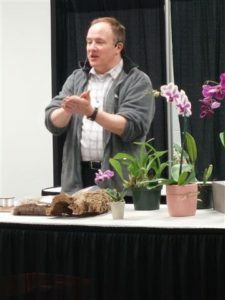 Frank Feysa, AIFD, also known as the chapter’s Orchid Guru, gave stage presentations on orchid care and propagation for the home grower. He shared design skills with hands-on workshops constructing floral jewelry with flowers and decorative wire. Leanna Gearhart-Theye, AIFD, was the star when it came to the children. Her presentation of “It’s all about the kids” was just awesome. The kids loved it! Then to top it off she offered a workshop just for kids where they made topiaries, tiaras, and ties. While all the stage presentations and hands-on workshops were going on, the AIFD “Blooms to Go” fresh cut flower market was being manned by a hard working crew. 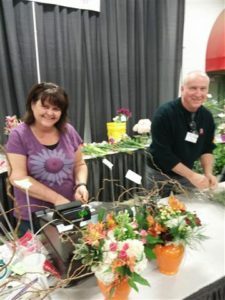 Members from throughout the North Central region came to help out with set-up, tear down, flower processing, designing mixed bouquets, sales and customer service. One of the most critical factors involved with this event was processing and storage of the volume of fresh cut flowers. Toomie Farris AIFD, McNamara Florist, offered us space at the McNamara Design Center to process and store our product for the show. Syndicate Sales, Smithers Oasis, Fitz Design, Elite Growers, Marvin’s Wholesale Florist and Bill Doran Company generously provided donations and procurement of fresh product and hard goods. The next Indiana Flower and Patio Show will be held March 11 – 19, 2017.